As part of their Contemporary Art Evening Auction on 16 May, Sotheby’s New York will offer David Hockney’s Pacific Coast Highway and Santa Monica (1990). Critics believe that this late addition to the sale will fetch a record-breaking price, with estimates reaching £22 million ($30 million). 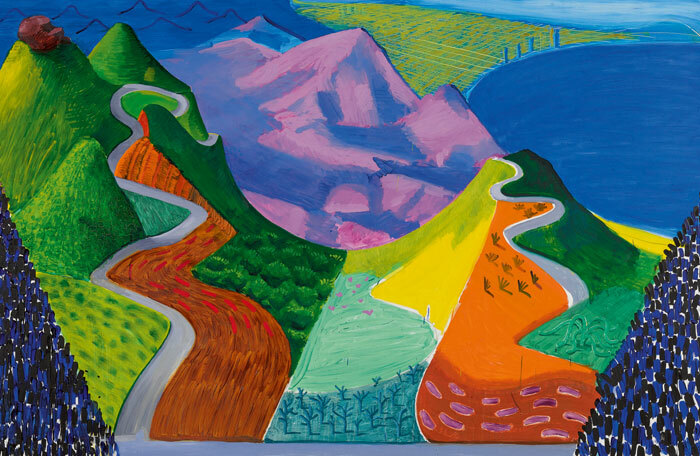 The large-scale painting is a landscape that was inspired by Hockney’s daily drive to his studio in Los Angeles. The scene of rolling hills and mountainous slopes were supposedly painted from memory. Hues of chartreuse, tangerine, rose, lavender and cerulean are sprawled across its 10-foot wide canvas, adding depth and intrigue to the piece. The painting epitomises the artist’s bold use of colour—a characteristic that has long defined Hockney’s oeuvre. Pacific Coast Highway and Santa Monica is one of a limited group of California landscape paintings by the artist, created during a significant period of his 60-year long career. Today, Hockney is still considered one of the most influential artists of the 20th Century—being a large contributor to the Pop Art movement. Sotheby’s will offer David Hockney’s Pacific Coast Highway and Santa Monica during their Contemporary Art Evening Auction in New York, 16 May.